Christopher Nsubuga is a 13 years old boy and studying in Primary Five at Nabalanga Primary school in Mukono district, Uganda. Christopher was born with a physical disability. His right leg was crippled and the doctors termed it as Congenital Agnesia Rt Tibia. His father abandoned him at birth after learning of this condition. His Mum later married another man and left Christopher under the care of his elderly grandparents. The grandmother passed on later and he only lived with his grandfather. Suubi Community Projects Uganda started supporting Christopher in 2014 after meeting him at a local school. He is a lovely, happy and very active young boy. He was always away from school because his grandfather could not afford to pay the school fees. We started by sponsoring his school fees. Despite his condition, he had to walk about 3km to and from school every day. This often exhausted him and he was losing motivation to go on with school. In 2015, we connected him to a local organisation that runs a hospital that rehabilitates children with disabilities. 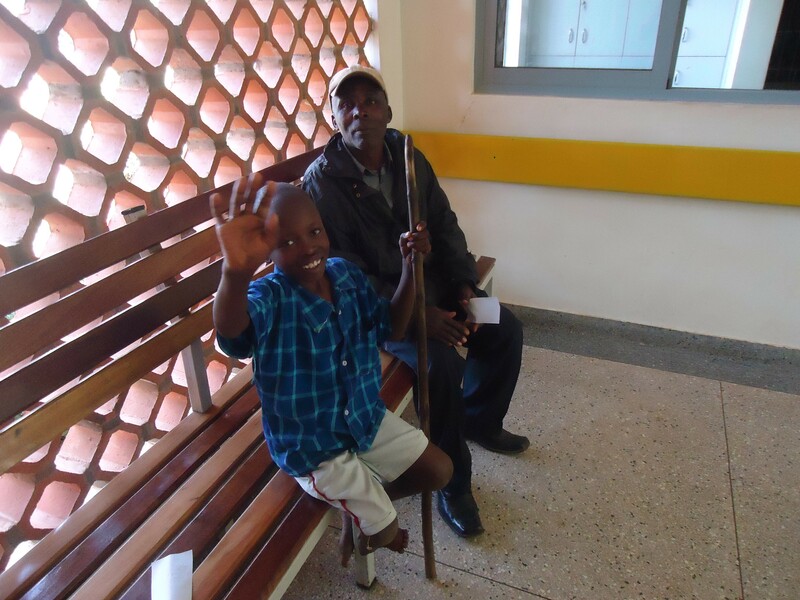 He was lucky to get a funded surgery and Prosthesis (artificial leg). Friends in Luxembourg paid for his hospital stay and other requirements after the surgery. For the first time in his life, Christopher could walk on two legs without any support. Life changed greatly, it was a miracle for him and his family. Soon after the surgery, we enrolled him into a boarding school. Life has been good since then. He has been very happy and healthy. However, Christopher has now outgrown his artificial leg. He no longer can balance or walk well with it. He has resorted to using clutches again. Life is becoming a little difficult for him again. Unfortunately this time round, the hospital that carried out surgery on him 4 years back, is unable to sponsor him with a new leg again. We are urgently seeking for $1800 to get him a new prosthesis (leg) and all the other associated supplies. We humbly request for your support. No amount is small. Every amount counts. Please help us to help him, and he will help someone else in the future.